Suunto Ambit3 Peak includes GPS navigation which allows you to navigate to a pre-defined destination stored as a point of interest (POI). You can also navigate when you are recording an exercise (see Navigating during exercise). Scroll to POIs (Points of interest) using Light Lock and select with Next. Scroll to the POI you wish to navigate to with Start Stop or Light Lock and select with Next. Press Next to select Navigate. If you are using the compass for the first time, you need to calibrate it (see Calibrating compass). After activating the compass, the watch starts searching for a GPS signal and displays GPS found after acquiring the signal. When stationary or moving slowly (<4 km/h), the watch shows you the direction to the POI (or waypoint if navigating a route) based on the compass bearing. While moving (>4 km/h), the watch shows you the direction to the POI (or waypoint if navigating a route) based on GPS. The direction to your target, or bearing, is shown with the empty triangle. Your direction of travel, or heading, is indicated by the solid lines at the top of the display. Aligning these two ensures you are moving in the correct direction. 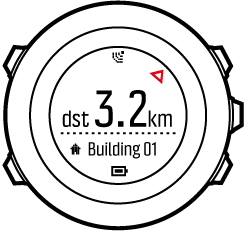 Suunto Ambit3 Peak allows you to check the coordinates of your current location using GPS. 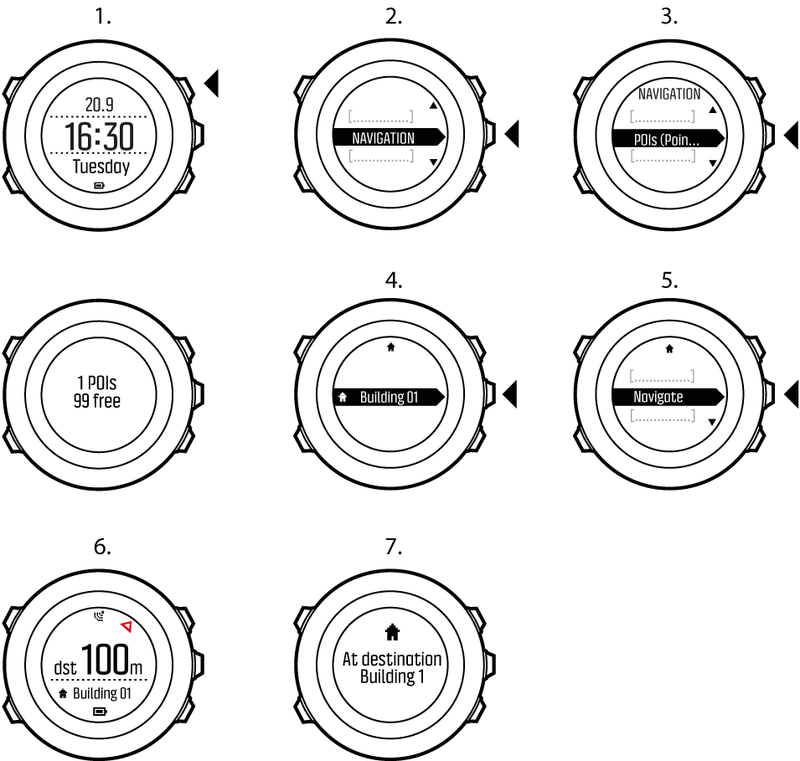 Suunto Ambit3 Peak allows you to save your current location or define a location as a POI. You can navigate to a saved POI anytime, for example, during your exercise. You can store up to 250 POIs in the watch. Note that also routes take up this quota. For example, if you have a route with 60 waypoints, you can additionally store 190 POIs in the watch. Press Start Stop to save the location. Select a suitable POI type for the location. Scroll through the POI types with Start Stop or Light Lock. Select a POI type with Next. Select a suitable name for the location. Scroll through the name options with Start Stop or Light Lock. Select a name with Next. Press Start Stop to save the POI. You can create POIs in Movescount by selecting a location on a map or inserting the coordinates. POIs in your Suunto Ambit3 Peak and in Movescount are always synchronized when you connect the watch to Movescount. You can delete a POI directly in the watch or through Movescount. However, when you delete a POI in Movescount and synchronize your Suunto Ambit3 Peak, the POI is deleted from the watch but only disabled in Movescount. Scroll to the POI you wish to delete with Start Stop or Light Lock and select with Next. Scroll to Delete with Start Stop. Select with Next. Press Start Stop to confirm.